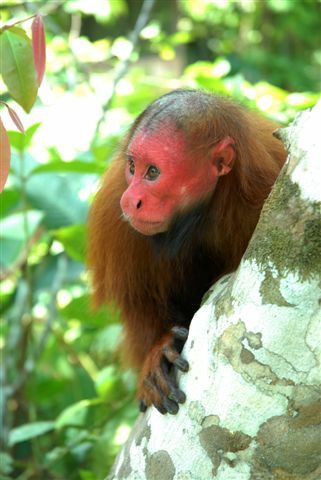 Rare and endangered Red Uakari Monkey (Cacajao calvus), Northern Brazil. 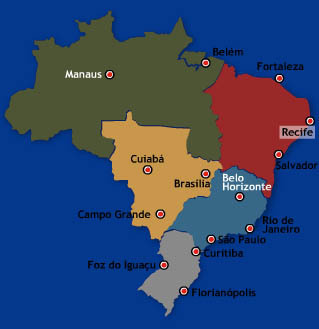 The North or Amazonia is the largest region of Brazil and perhaps the most internationally famous. The Amazon is also the largest area of tropical rainforest in the world, having become a worldwide synonym of biodiversity. However, in relation to the rest of the country, it is sparsely populated and includes vast areas that are virtually inaccessible, despite countless attempts at taming the jungle through agriculture, industrial development and farming. Now the Amazon is discovering its ultimate vocation as one of the world's most exotic travel destinations. The Northeast region, with an area of 1,556,001 km2 (18% of the total area of Brazil) and nearly 45 million inhabitants, is divided into nine states: Bahia, Sergipe, Alagoas, Pernambuco (including the Archipelago of Fernando de Noronha), Paraíba, Rio Grande do Norte, Ceará, Piauí and Maranhão. The Northeast was once the economic heart of colonial Brazil, with Salvador as its capital and the captaincy of Pernambuco, with its white gold (sugar), as the most developed and richest province. Today the colonial architecture, a silent testimony to great wealth, still stands as an impressive monument to artistry and craftsmanship. The racial mix in the Northeast makes for a startling contrast to the predominantly white, European ancestry of the South. Centuries-old traditions have kept the folklore and art of the region alive from generation to generation. The coastline of the Northeast stretches for thousands of kilometres from the south of Bahia to the northeast of Maranhão and boasts the most beautiful beaches in Brazil. Where the blue-green ocean water seems limitless and the sunshine eternal, some fantastic beach hotels and resorts can be found, whilst the adventure traveller has no problem discovering wild and unspoilt beaches such as Jeriocoacoara in the state of Ceará and Lençóis Maranhenses (a National Park) in the state of Maranhão. The sparsely populated interior guards natural monuments that will amaze even the most experienced traveller, such as the uplands of Chapada Diamantina in the interior of Bahia, the National parks of Ubajara and Sete Cidades and the backlands of Pernambuco. 345 kilometres off the Northeast coast there is also the archipelago of Fernando de Noronha, comprising 21 volcanic islands created over 10 million years ago. The Pantanal, Central Western Brazil. The Central West region comprises of the states of Mato Grosso, Mato Grosso do Sul, Goiás and the Federal District of Brasilia. The area is especially known for the Pantanal. The Pantanal, a vast wetland area in western Brazil, which cuts across the states of Mato Grosso and Mato Grosso do Sul (as well as western Brazil and northeastern Paraguay) is one of the world's great wildlife reserves. Because of the veldt-like open land, it is also the best place to see wildlife in Brazil. 650 species of birds, among which are storks (including the stately tuiuiu or jabiru stork), egrets, herons, coots, ducks and ibises, can be observed in the region. Animal life is represented by, among others, sunbathing alligators, deer, otters, emus, boa constrictors and monkeys. All these can be seen by visitors with only a few hours to spare in the Pantanal. Cuiabá, founded in 1719 by a group of slave-hunters, now the capital of Mato Grosso, is the major gateway to the Pantanal. 135 km from Cuiabá, penetrating deep into the Pantanal starts the Transpantaneira Highway, a 150 km road, elevated 2-3 meters above the flooded plains, which starts right after the village of Poconé and ends at Porto Jofre. Other gateways to the Pantanal are Campo Grande and Corumbá. There are two distinct seasons: the rainy season from December to March, when most of the area floods, and the dry season (July to October), the nesting and breeding season. The climate is humid tropical with temperatures between 7ºC (in the coldest months: June and July) and 40ºC (in summer: December to February). The average temperature is 24ºC. A visit to the North Pantanal (starting in Cuiabá) can easily be combined with a visit to the Chapada dos Guimarães. These tablelands, located only 65 km from Cuiabá and about 800 meters above sea level, are considered one of the oldest plateaus on earth. 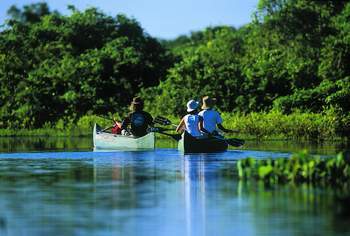 Home to the newly established national park with magnificent rock sculptures, caves and waterfalls, it overlooks the Paraguay river and the Pantanal floodplains. Highlights of a visit to the Chapada dos Guimarães are the Véu da Noiva (bride's veil) waterfall, the lookout of the Geodesic Center of South-America and the Andorinhas Falls. When visiting the South Pantanal (starting in Campo Grande), it is only a short but very worthwhile trip to the village of Bonito in the Serra do Bodoquena, a famous center for adventure and eco-tourism. The Bodoquena Hills, which are very rich in limestone, granite, marble and minerals, offer excellent possibilities for horse-riding, rafting, swimming in crystal clear rivers, mountain-biking, trekking, potholing, snorkeling, fishing, rock climbing and even cavern-diving. Highlights of a visit are the Gruta do Lago Azul (Blue Lake Cavern) and snorkeling down the Sucuri river. Sugarloaf, Rio de Janeiro, Southeastern Brazil. 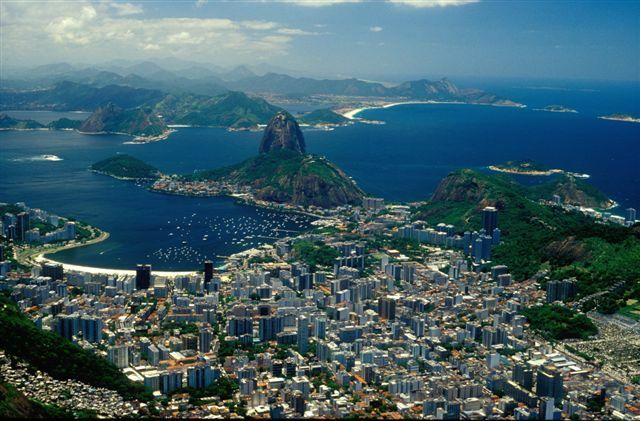 Although not the first region to be colonised, since the 16th century the Southeast has been the economic hub of Brazil, centred first on Rio de Janeiro and subsequently on the industrial and commercial megalopolis of São Paulo, one of the world's most populated cities. The inland state of Minas Gerais, Brazil's leading dairy farming region, and the coastal state of Espírito Santo complete the region. Rio lost its status as the nation's capital in 1960, but the Southeast's supremacy in economic and cultural terms remains unchallenged. The cradle of the Brazilian empire, independence, and republic, Rio de Janeiro's immense historical wealth in fine buildings, palaces, theatres and museums complements her natural splendour. Ascending the Serra do Mar mountain range reveals that the interior of Rio de Janeiro State is also rich in history and nature. The summer residence of the former Brazilian Emperor and his family gave birth to the charming towns of Petrópolis and Teresópolis, whilst the Paraíba Valley saw the country's first coffee plantations. Boasting some of the highest peaks in Brazil, Itatiaia is Brazil's oldest National Park. 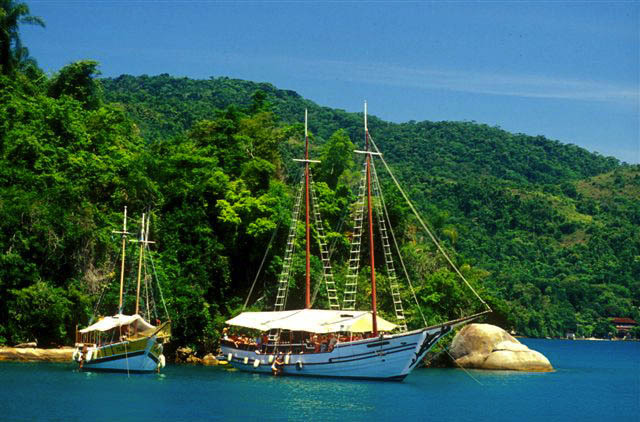 Returning to the coast once again, the atmosphere of colonial Brazil can still be felt in the town of Paraty, an 18th century gold and diamond port whose subsequent isolation has preserved architectural beauty worthy of World Heritage Monument status. Minas Gerais, the fifth largest state in Brazil, hosts a collection of early eighteenth-century towns, the Cidades Históricas with among others Ouro Preto, Mariana, Congonhas, São João del Rei and Tiradentes. Originally mining camps, the gold rush quickly transformed these towns into treasure houses, not only of gold, but -- more permanently -- of fine Baroque art and architecture. Elegant colonial churches, steep cobblestone streets, ornate mansions and even the historical atmosphere have all been preserved to make the cities one of the most impressive colonial legacies of the Americas. The states of Paraná, Santa Catarina and Rio Grande do Sul make up the most European region of Brazil, having been colonised largely by Germans, Italians and immigrants from Eastern Europe, many of whose traditions have been preserved, along with the influences of the Spanish colonisation of the nearby countries of Uruguay, Paraguay and Argentina. One of the world's most impressive nature monuments is located at the meeting point of Brazil, Argentina and Paraguay: the Iguaçu Falls. Iguaçu means "Great River" in the indigenous Guarani language and there could hardly be a more fitting name. After rising in the Brazilian highlands near Curitiba, the Iguaçu river runs westward on a 1,100 km journey, receiving some 30 tributaries on its course to the plateau where, just before merging with the great Paraná river, it falls thunderously over an 80m-high cliff in virgin forest. 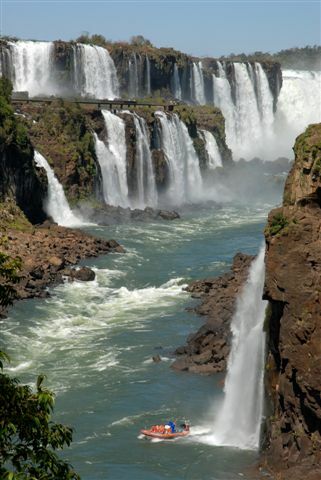 Set in a National Park of the same name, the Iguaçu falls are the most spectacular in South America. A total of 275 falls cascade over a precipice that is 3km wide, sending up an endless wall of spray laced with rainbows. At the heart of this unforgettable scene is the Devil's Throat, where 14 separate falls join forces. © 2013 Inka's Empire Corporation, Luxury Travel Peru & Luxury Tours Peru. All rights reserved.